It is also obvious to me that my capacity to be useful has increased tremendously, most of the hours in my days are productive whereas previously I needed so much more time to recover from my work. My sleeping, memory, and mental clarity have all improved. My relationships are healthier and more enjoyable. I feel incredibly strong and powerful within myself and at the same time I am in touch with the beauty and delicacy of life and value it like never before. Krishanji, I am thrilled to be on this yogic journey and it has been a privilege to attend courses with you. It is not possible for me to fully express my gratitude to you. 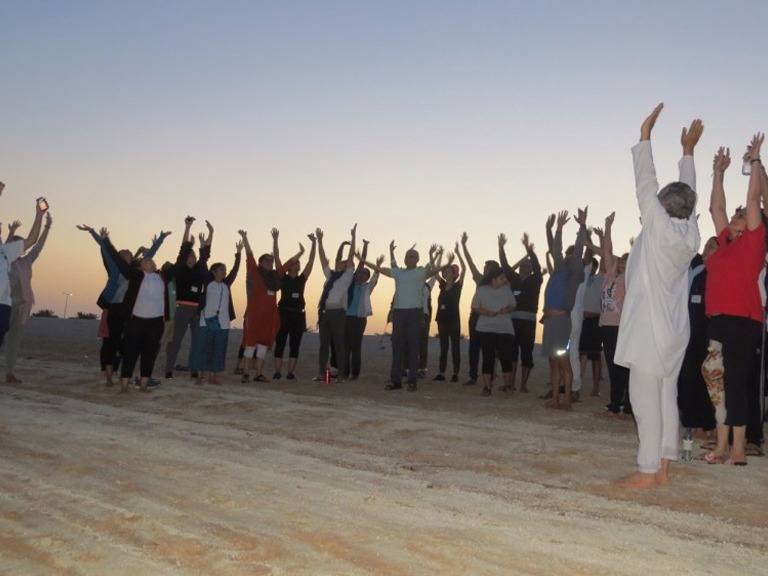 There was a big gap in my knowledge of what life is and how to live like a yogi and you have perfectly filled the gap by generously sharing your time and experience, the longer courses have been especially beneficial for me. I feel blessed to be your student. One class with him, few words or even just one gaze from him and you feel you are done. You are there. Diving in that Union, in that pure experience of Yoga. No more need of any practice. 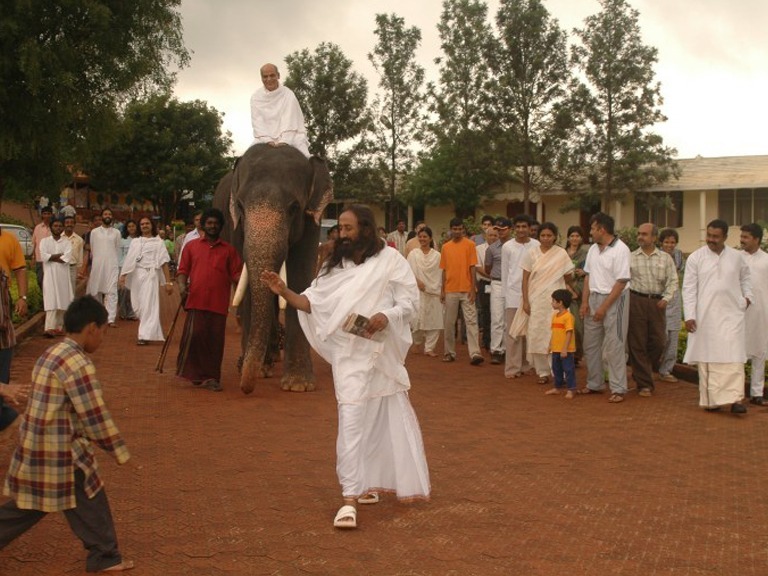 I’ve had the privilege of walking with him for more than 15 yrs now, under the blessing of Gurudev. Growing, falling, learning, melting, raising .. starting new again and again, thousands times. I have the privilege of learning everyday from him, from his humbleness, his humor, his vibrant being human as well as much beyond that. That sacredness and divinity which is our own nature. The same that we all are. Yet somehow fully unfolded there. Available there to quench your thirst for it. What is again and again attracting me on this path of Yoga is fully there in his very unique way of conveying and teaching, of guiding you in such a delicate, loving at the same time always surprising, sometimes unexpected and very direct way. You can’t escape. He knows you as he abides in that Union where there is no two. That Union which is the real meaning and ultimate goal of Yoga. Your instructions to go into a posture were making my mind more flexible, I could bare difficulties with much more ease, I was smiling while holding longer, I had full trust that you will not ask me to hold more than I could bare and never thought when you would instruct me to come out of a posture. Stretching a bit more after a long hold was making me realize that I can always do more in life, give more, bare more, support more, don’t give up before doing few times a bit more. All thoughts and images were coming like a realization that you were teaching me life lessons and that physical part of Yoga was just a mere by product. I was loving discovering myself and opening up while following your instructions. And they were those magical moments were you were entering my mind and I was hearing your instructions before you verbalizing them. And other moments where I had the impression that you were talking to me as if I was in a one to one course even though we had no eye contact, so I was thinking that Krishanji is connected with each one of us simultaneously! The ability to expound on spiritual concepts is something many learned teachers can do, but I believe I was blessed to have a teacher who gave each piece of wisdom out like a seed and somehow planted them all in my heart. I have had the privilege of watching the seeds sprout and grow over the last 12 years as I have grown more and more into the adult that I always wanted to be. In my training I had an experience of the depth of my own nature, the silent pool just below the rippling surface of my mind; I felt the freedom, connection, playfulness I knew as a small child; and I felt the strength of my own stability, the equipoise I would later use to navigate some difficult challenges life had in store for me…..
Also, on the physical level, you’ve given me the knowledge and practical experience to remedy the imbalances that come up as part of life.. through this gift you’ve added resilience and balance to my physical life – and confidence that I can do so much to look after my body. I now have the capacity to create and maintain that feeling of comfort, liveliness and harmony in my physical body. I know that via the yogic practices I am doing everything I can to continue to be as physically fit, healthy and well as I can be. The result of periodically attending retreats with you and regularly practicing the things you’ve taught me over the past 14 years, is that my emotions are no longer volatile, instead my emotional life is balanced and rich with insight and freedom. Depression, anxiety, frustration have turned from being major battles in my life to being tiny fluctuations in my mind. Your presence and guidance in my life in addition to all your programmes and trainings that I have attended with you have changed my life in ways that I cannot even express in words. However I will attempt to express the inexpressible. These words are just a mere glimpse of the impact that you made and continue to make in my life. Yoga has truly become a way of life for me and not just a practice. I have learnt the true essence of Yoga with you. Your teachings have added so much depth, reverence and beauty to my Yoga practice and life in general. My expression and perception of life has deepened and become so much more meaningful. Your teachings have so much of simplicity, humility, practicality, loads of fun and sacredness and this translates into an experiential reality for me in my day to day to life. It brings a lot of inspiration to all aspects of my life. Not a day goes by where I do not ponder on and experience/implement something that I have learnt with you. This continues to add more value and depth to my life. Most importantly I feel that I have become a better and stronger person. Sitting on a course of Krishanji’s is truly a joyful experience, one instantly feels “precious” J On my very first session with him during my Yoga teacher training in April 2018 he said to us, “We are here to make you Yogi’s” with the underlining meaning “so you will automatically become beautiful yoga instructors”, it’s hard not become a yogi when you take a training course/program/workshop with him. With a perfect blend of physical asanas coupled with yogic wisdom, I have to say that I felt hand held to realize my very obstacles on the path of yoga enabling me to overcome my boundaries of physical and mental limitations… growth was inevitable! 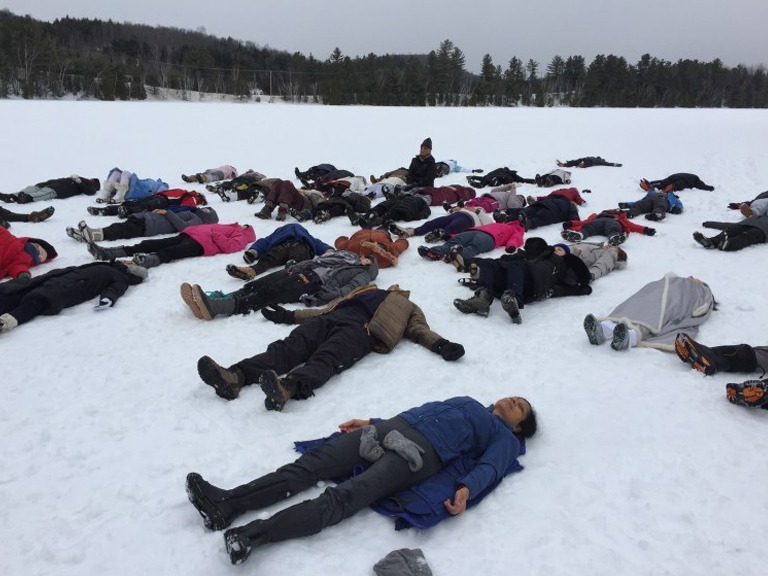 During the 2 weeks that were spent with him during the TTP in Boone, NC (USA) and later on the Yoga instructor’s refresher meet, every session was different! Processes that he conducted not only brought strength and flexibility for my body without doubt helped me realize courage in the mind. The methodology and sequence of doing asanas developed by him are truly unique, extending it to my students I have seen immense healing for them and elevation in their mindsets, I only have him to thank. No words justify the complete packaged experience of spiritual development one can experience during his programs. For a true seeker it’s a “precious” treat, and I hope that many in this world will experience the bequest of his teaching. Namaste. From my first real encounter with yoga experience in Oct 2004 during Sri Sri Yoga TTC 1 in Taiwan, I experienced the deepest rest and emptiness of the mind. From time to time, I experienced that again. Looking back, those moments of silences all tend to relate to Krishanji’s courses, be it Sri Sri Yoga, Therapeutic Yoga, Advance Meditation or Himalaya Awakening. Somehow, it is the way Krishanji leads the stretches and prepares our mind before we sit down for the meditation. Also, it is the way he delivers the knowledge because he has gone through it and understands it fully. He is a true Yogi leading by example. Studying yoga with Krishanji helped me comprehend yoga, not only as a life style but also as a way of being: Simple, childlike, joyful and wise. He rekindles human values such as genuine care, love and selfless service in his students as a walking example. To me, he is not only a yoga teacher but a living example of a real yogi. Dearly inspired by him, I consider learning yoga in the presence of such a yoga teacher as a privilege. Learning from and being with Krishanji is a transformational experience. His methods and teachings are not only from the ancient scriptures but are made alive to us from his own experience. He is truly a Yogi himself and just being in his presence inspires me to follow the path of Yoga in a bona fide and authentic way. He is also charming and infectiously witty and makes the most challenging knowledge and techniques so easy and effortless. True to the tradition of Yoga we come out transformed not only at the body level but also learn to master and align our minds in service of ourselves and mankind. If you wish to live this life well, you certainly need an encounter with our amazing Krishanji! No words can describe the experience adequately. I feel eternally grateful to be on this path of Yoga and more so with his guidance. Just returned to SA after spending 3 weeks at the Himalayan Awakening (Yoga Retreat) in Montreal. A life changing experience …. not easy to describe in words except to say that ….. it was the most valuable, most enjoyable, most precious time … with a teacher that I am blessed to be guided by on this journey of Life. An evening session at the Himalayan Awakening …. It is -3degrees outside on this late evening at Montreal ashram. But inside the meditation hall is warm and cozy with soft lighting. The silence is deep. Some 55 of us sit meditating or just quietly reflecting, while others relax lying on their backs while we wait for our dear teacher KrishanJi to enter. We wonder what this evening holds for us …. Will He speak about the scriptures? Will He answer some of our questions with so much love & patience? Perhaps some Guru stories ? We will no doubt end with a late night yoga session of sweet torture…. and thereafter soft Nidra like a mother putting her children to sleep, always giving us divine blessings to end the session. His majestic figure enters, stepping quietly, with so much humility. The ones lying down sit up without being prompted, sensing His presence. He does his usual routine with the candle, then sits in His place and lights up the room with His shy smile. Our dear dear KrishanJi. Whatever the night holds for us, we are assured of the love & intimacy that only few are likely to experience. This is true Upanishad. And I think to myself …. how blessed I am. Firstly, you create and maintain a wonderful learning atmosphere, free from judgement and expectation. So, on your courses, I am able to relax completely and be myself while learning. You also thoroughly embody the yogic teachings. Your example of simplicity, compassion, love and service inspires me. It’s a magical combination to be allowed to totally relax while also feeling inspired to develop my potential. Without doubt the greatest gift I find in your courses is the way you empower me. Your emphasis on clearly explaining exactly what I can do to clear my mind and experience the unbound joy and depth of yoga has left me with a simple road map. And KrishanJi, I use this map to navigate the most challenging moments in life, staying as centered and clear as I possibly can. Being told by you that I am the one who must initiate my own practice and having been given all the instruction and encouragement to do it has empowered me tremendously. I was so scattered and only after doing the first SSYoga course with you, did I find my peace within. It was after your teaching that I started becoming regular with my practises and recognized that I needed to prioritize myself , time with myself. Before you had come into my life, I never enjoyed spending time with myself. You taught me to celebrate each moment, to find my joy in myself and with the regular discipline of yoga instilled in me, my journey became that much more sweeter. Your simple yet profound knowledge about what is true Yoga, has certainly changed my perspective towards Yoga. Before I met you, I thought Yoga is pursuing deeper and more challenging postures. But during your classes, simple and basic postures already good enough for me to achieve a relax state of mind and body. That’s when I suddenly awaken from my previous understanding of, yoga has to be hard and challenging! The above is just physical level. What about the mind? Chitta Vritti Nirodha.. You utter this sutra many times during our retreat in Langkawi. THAT’S IS YOGA, says you. And today, I have this sutra inked on my arm, and certainly deep inside my heart. My yoga journey will never end. The matter of fact, the true journey began after I met you. Before that, Yoga was merely an external and physical practice for me. I can’t say enough to thank you, and Bhartiji for showing us, pure love does exist. Moments with you in many places has gave me strength and faith that this is the right path. It’s a life transformation since year 2010 when I attended TTP with Krishanji , and the magic is still continuing every time when I be in his courses. His words, his love, his compassion and his authenticity is something makes him a yogi in his own way. He never share something which are not coming from his real experience. His teaching and Yogic wisdom is so universal. There is a farmer with big. and bright eyes like sunshine. He is quiet and peaceful like moon. One day, the farmer sowed the seed in the yoga farm in 2005. The tiny seed has been watered and nurtured with grace of love. One day, the seed sprouted. The farmer started nourishing it with yoga wisdom at its each breath in and breath out. As the days went by, the seed became a tiny tree, and it grew bigger and bigger, taller and taller. The tree went through all the situations, whether it was hot or cold, whether it was sunny or rainy,. whether it was cloudy or stormy, The farmer stood by the tree all the way, by telling Patanjali ‘s knowledge such a profound, deep and practical wisdom; by playing flute to soothe its agitated mind; by his presence –being ONE with him. The ancient love is showering upon the tree. Krishanji is not a yoga teacher in the traditional sense of the word. He is a reflection of the Divine consciousness and a mirror of the mystical, subtle levels of existence. When he teaches, I feel a calming, serene, playful, and wise presence in the room. Krishanji is able to transmit an experience that comes from an authentic yoga practice – where I feel connected to myself, the universe around me, and rejoice in just Being. Through Krishanji I learned my most valuable insight as a yoga teacher – that the teaching is not coming from me. When I am connected to the source of all wisdom and knowledge, it simply flows out in a way that benefits those receiving the teaching. Krishanji walks the talk. Its as simple as that. He doesn’t share anything that is not in his direct experience and that he has not experimented with on himself. This is why his courses are so powerful and full of grace. I have had some of my most profound spiritual experiences and transformations on programs with Krishanji. Krishanji says very little but the love and grace radiates in his presence, and transforms something deep within, and you have no choice but to also start radiating the same. I would like to write so much more but i’ll leave it here as I was asked to keep it short. This lifetime is blessed because of the presence of Guruji and Krishanji in my life. I am so fortunate to be a student of Krishanji. I came from a software engineering background. PE was never my favorite class in school days. I never thought of becoming a PE or yoga instructor when I was growing up. For many years, my approach to spiritual knowledge was through intellectual understanding, and my understanding of Yoga was limited. When I took Krishanji’s course, and later the Sri Sri Yoga teacher training, I felt deep fatherly love from Krishnaji. His presence is so natural, humble, loving, truthful and full of devotion. Just by sitting in his presence, analytical words and intellectual understanding lose their charm, I experienced so much love and contentment, which made it easy for me to transit from mind to heart. Krishnaji ‘s teaching is very simple yet very profound. He has amazing ability to point out our delusion in a straight forward yet most loving way. His words again and again help lead me from delusion to reality…..Krishanji is totally living what he teaches. That’s why his teaching carries so much power. He said: “The reality is simple and obvious, but it takes some level of humility and awareness to see it.” The path of yoga is blessed by masters of thousands year of tradition and I feel so grateful that Krishanji led me to tread the path of yoga. My mind is pulled into so many attractive things in this world. This voracious mind cannot be tamed. I chase after something that seems so convincing. Distracted by these desires and fears, preoccupied by the noise, I stumble into your blog, a video or your course. In a split moment, I am back again. Your voice, your few words, your kindness, your simplicity, your peace remind me all over again. All that i am looking for, all that I want is there. It opens me to beauty, strength and something so sweet. My heart knows how precious it is. And tears come flowing down. I don’t know how I deserve this, but I am grateful to you. Thank you for being you, thank you for reminding me of me. I was in AOL for 5 years, and already teaching Part 1 when I first met KrishanJi. This is when my Yoga journey truly began : when I went to Canada for Sri Sri Yoga TTC. Through his loving guidance I learnt to do asana’s properly. I started to go into a deep state through asana. This was a new experience for me then. A magical gift. And the simplicity with which he explained the knowledge, made it so easy to understand and digest. I realised with time that it was more than just knowledge and technique that I was getting from this teacher. It was the grace that he carries as a Yogi that was making it happen. I was inspired to spread this knowledge of Yoga. Over the next few years I was blessed to assist KrishanJi in many SSYTTC’s. I learnt so much in these years & I continue to do so. I attend as many courses as I can with KrishanJi, even if it means traveling far. I know that I still have a long way to go. However, where I have reached thus far has so much to do with KrishanJi. I am truly grateful to have this precious teacher and mentor in my life. For me he is an extention of the Guru. I long to be in his space just like I long to be with GuruJi. My humble pranaams to my teacher. All these years, no matter which courses I attended in different countries，with different languages or culture, I had witnessed everytime how Krishanji‘s sharing moved people into tears and joy. The simplicity of his sharing always reflects the light of truth. He speaks the language of the heart. Being in his space itself is a healing process. Not to mention his bhakti shows his devotion in a way that his cell reflect the longing towards master, towards god. I’m gratefull to have such yoga mentor in this path accompanying me moving from the rawness to the maturity on this path and seeing the universal truth. I did the course with you in Dec 2011, exactly 3 years ago in los angeles center. It was a 6-7 day course and I wanted to let you know this course changed my life in a big way. I have been doing my sri sri yoga practice – 1 hour daily following the go-home insructions. i do this every day for an hour and take a break once a week for a day as instructed by you. Some of the benefits that i had immediately within a month of doing this was: Dosha balancing (I re-took the dosha analysis form given by Sriram). My Pitta was very high and my kapha was bare minimum when i started and within a month this was balanced out! i couldnt have any citrus fruits etc – and most of the food did not suit me created a lot of acidity and other discomforts. But that was completely fixed. Now having been doing this for 3 years (not missed a day except when i was ill or the weekly break) – I can say – this has provided strength, muscles, balance, high prana, ability to eat anything at anytime without thinking of consequences, balanced doshas, and overall sense of wellbeing and gratitude!! The only question that I had asked you during the course was – How long does it take to make it a regular practice just like Kriya and you had said 90 days. And I can say with confidence – that having done this regularly now – I cannot stay without it..just like kriya 🙂 So thank you, thank you, thank you!! I am so Happy to start follow you blog, you are so ispiring even if we leave so far. I can feel your presence right now while i read your word. I feel so lucky to meet you in Bad Antogast during the Summer 2017. TTP has been very constructive with you i feel very bless! i keep reading please write as much as you can… . My path to be a yogi began with you. i still remember the simplisity and stillness of the mind , the joy and enthusiasm i experienced in my first SSY ttc in Taiwan. over the years my mind seems to be a bit confused , cluttered , and judgemental. this last Penang yoga retreat has brought some of the experiences back, your sharings and words of wisdom have sunken in, you are my inspiration on the path. you bring me closer to Guruji. The 10day retreat has enabled me to find grace n gratitude in moments of my daily life. Perhaps its the spirituality of yoga at play…….honour & respect. Krisanji has his humorous way of inculcating spirituality in us. We can always choose to “travel light” if we want, after all there are no luggage restrictions. All thanks to Krisanji for his guidance and all those present at the retreat. 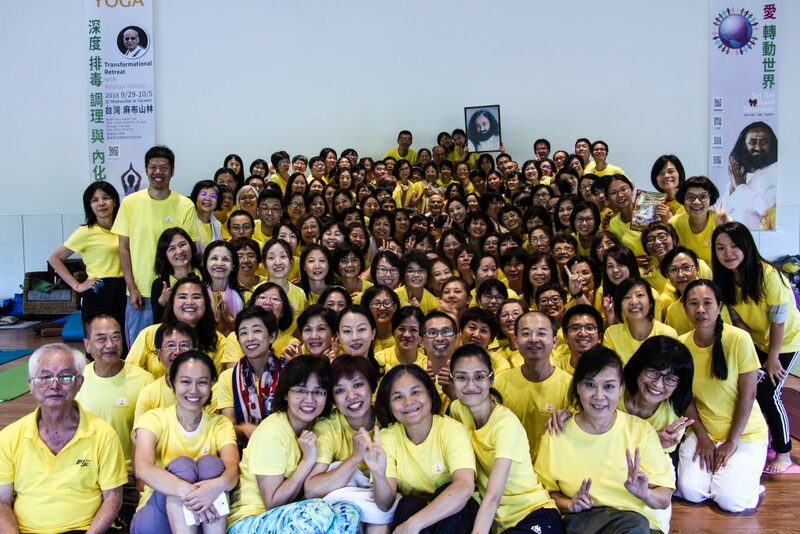 I am truly grateful to have been joining your courses in Penang, Malaysia for two consecutive years. I have been carrying & struggling with some impressions in my system since end of 2016. Eversince then, I had been having trouble going deep into meditation, as how I used to be. But Intensive Advanced Meditation came as a divine blessing from the Master through you. I put forth my query to you in a paper on Day 3, and i found myself speechless when I went so deep into meditation right after morning sadhana on final day. I did not want to let go of that moment, & stayed as long as I could, savouring every bit of that divine presence. That moment revealed to me that we are all “headless”; as been mentioned by our Master. With tears of gratitude flowing continuously from my eyes, i bowed down to the Master & HIS presence in the form of Krishanji. Thank you for being you. I also sent out the merits of this deep meditation to all sevak angels, fellow participants & the entire world. With love & gratitude. The 10 days course was really inspiring to me as I really find a new understanding about Art Of Living. I feel gratitude and blessed with love. all the bhajans had touched my deepest part of my heart and mind. I can’t stop myself from remembering the rhythm and tears from my eyes, especially OM NAMAh SHIVAYA by Krishanji. The Yoga part was great too as I feel I am in the touch with it, each stretch make me feel my part of body, which part of body is weak and strong. I don’t know how to express about the gratitude to Krishanji that make me feel I am reborn on this path. I just want to say Thank You to Krishanji for making these 10 days a memorable event in my life. As now I think about the camp, I would eventually feel that I had the tears of love and gratitude in my heart. Really thanks to everyone for making one of the best camp for me. I only have deepest gratitude in my being for your guidance. I took your Sri Sri Yoga Part II class in DC and have never experienced asanas in the way you taught them–integrating asana with yoga. I have never felt my body in so much awareness and love. Every cell in my body was rejoicing and in each posture there deep prayer to the divine. You are a gifted teacher and I anxiously await your next course and hope to take teacher’s training with you. We appreciate your love, attention, enthusiasm, and efforts for conducting our sublime Yoga Immersion course, in Dallas. You held the sessions efficiently with playfulness and humor while making it an informative, enjoyable, restful, and rejuvenating experience. You brought vast knowledge from Patanjali Yog sutras and Himalayan Masters, in a way that we all could understand and apply in our daily life. You demonstrated the importance of doing asanas by effort, perfected with relaxation and meditation on the infinite, from outer to inner activity and silence. We are grateful that you shared your knowledge of and experience with techniques and games while directing our mind towards GuruJi. Although I have been practicing yoga & meditation for several years, your course furthered building my internal environment. This experience will renew previously taught practices and recognize that with the divine guidance of Guruji’s directed teachers, I learn to tap the depth of nature. Leena and I look forward to seeing you at Satsang and other programs. My rgds to Bharatiji. I remember her teaching functional anatomy and physiology so and patiently and sincerely. We are indeed privileged and blessed to have gifted teachers like of both. He made us climb the mountain, Right to the Top! Not only did we climb it, but he established that mountain deep inside us too! A mountain of faith, A mountain of peace, A mountain of joy, A mountain of LOVE! We reached the pinnacle of devotion, And just stayed there, singing and dancing in ecstasy! His presence magical & infinite, His words carrying a universe within a universe, His smile like the blossom of a thousand petals, His eyes sparkling divinity! To him, who has opened another dimension to existence, I offer my humble pranams, To him who has taken us from the real to the “real” I offer my humble pranams… Thankyou Krishanji! You have set a heart on fire again, It is burning in sweet devotion! May your MAGIC touch all Beings! I was a part of your therapeutic yoga retreat which just concluded today at the Bangalore ashram. I was transported to the good old days of 2006 TTC of SSY that we did in Bangalore ashram. You made Yoga so simple. Kept telling us repeatedly not to compare, which is what we keep doing often. Most amazing program . Extremely honoured to have been a part of this program . Please keep coming to India . “Asatoma sadgamay”, “don’t focus too much on the body “, have had a profound effect on me. Thanks for being you , for living the knowledge you spoke , for being our role model Yogi.Thanks to our awesome Guruji for giving us Krishanji. I got a chance to attend your Himalayan Awakening course in Feb-March, 2018. I feel honored to share my experiences during those 21 incredible days of knowledge, gratitude and fun. We experienced the ultimate bliss and our souls are being pampered and relaxed thoroughly. During the unique processes in this course, I had been a witness of my own mind/thoughts and also could witness the witness. I experienced the witness earlier too during the deep meditation sometimes . But the second and third levels of witnessing is a very unique experience. Thank you very much for you and Bharati Ji for leading us through the wonderful experiences of soul searching. Beloved Krishanji. We are remembering you so much today. We feel so blessed to have you as our teacher. We long for be in your divine presence again, see your smile, & hear your voice again. A true yogi is rare and precious, and we feel so so so fortunate to have experienced YOU. Please come back to visit us in South Africa, we are all longing to drown in the devotion, knowledge, & simplicity that is Krishanji. Forever students who carry you in our hearts. Your blog posts continue to inspire me to move forward in love, devotion, and service. Words are in simple language, carrying depth and have helped uplift my spiritual practices. I was touched when you wrote, “To tell my story; I have to drop modesty ——-Modesty is a characteristic of the ego, and it belongs to the outer world.” I am reminded of my schoolteacher who told me that: Pride need not be a bad trait but don’t allow pride to get in your way So, having pride is completely acceptable, but being consumed by it is bad. Do not automatically castigate the opinion of others. You may even find yourself unnecessarily rejecting a good proposal or initiative only because you did not think of it. So, if you are smart, rely on your reasoning and if pride interferes then it is a feature not worth nurturing. Story RE; being extremely pseudo-humble and distorted-pride: A merchant considered himself as the most humble person to have ever lived. One day a villager told him that another person in a neighboring village was even more humble than him. Alas, the merchant was furious and shouted with anger that no living person can be more humble than him !! I think of you all the time and treasure the yoga classes with you in South Africa. 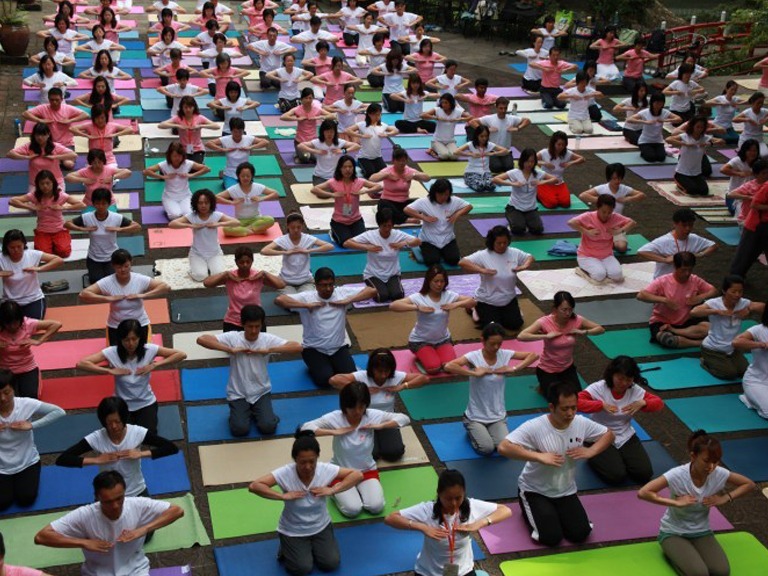 I wish every human being on the planet could get an opportunity to do yoga with you. Krishanji, I LOVE, and look forward and savour every post you write. The simplicity, love and devotion soothes my soul especially when I am in places where I am alone and it is very cold, and things are tough going. Thank you so much for sharing so much with us. Am truly blessed to call you my teacher. Beloved Krishanji, today is Teacher´s Day. I am so grateful to Guruji for you, he gave me many gifts but the honor of having you as a teacher, attending your workshops and helping you was one of the big blessings in my life. Thank you for your Love, caring, knowledge talks and advices . I celebrate you today. You have changed my life after doing the SSY 1 and TTC with you. I used to do my yoga practices trice a week , and after completing the course with you , i do it daily . I can not start my day without it . Thanks to you and GURUJI for moulding my life into a yogic one. Looking forward to see you again in South Africa. I consider myself lucky and blessed to have you as my Yoga teacher. Thank you for being you🙏 I had a very special yoga journey with you and is still continuing. In 2010 I did my first course with you and I loved being in your space. It was my first ever Yoga course and did the teacher training. Did not grasp fully what Yoga was about. I enjoyed the Asanas and practiced everyday after the course for a while. In 2017 I did the SSY TTP in Bad Antogast with you. It was magical experience for 18 days. I started understanding Yoga thanks to you and maybe I was a bit more ready and aware than few years back . I had an immense joy observing and learning from you. You don’t only teach perfect Asanas but transform each moment into a life experience. I was becoming more flexible and stronger but mostly I was growing and expending. I often think the best gift i have ever been granted by my master Sri Sri Ravi Shankar is the chance to be present at a Yogacharya Krishanji Verma’s courses. In these very deep retreats i have experienced a very profound understanding on Yoga, Love, God and the mysteries of the unknown. From early adolescence i had been chasing the secrets of yoga but they clearly can’t be explained merely with words. With Krishanji, a great devotional experience comes to life and with that, a whole new dimension is revealed. I truly haven’t found any other experience in this life near fulfilling, foundational or blissful. I had recommended this experience to all my close ones, and i recommend it to every human being urging for knowledge, love, understanding or willing to go beyond the limits of the mind. With love and gratefulness. I will never forget my experience on your courses….tears of gratitude and joy, feeling fully energized yet relaxed. To go from just an average Joe with no knowledge of yoga to such profound experience in just a few sessions….wow :). You are truly amazing. Hope to see you soon. Thank you for being there and bringing out the yogi in us 🙂 every moment with you was blissful. Your presence is always with us and we seek your blessings to walk the path you have shown us . First Thanks to Divine for blessed us with the Kishanji… Thank you Kishan ji for being there and being what you are.. We are blessed to have you.. “There is no difference in divine and devotee” this words becomes true when we got chance to sit in your presence.. as I found no difference in Guruji in You.. Love you so much! I feel more and more privileged to have been your student and blessed that the universe has steered my path in your direction because you touched me deeply which surpassed even the knowledge of yoga which you so passionately shared with us. I wish you happiness, wisdom and that your soul continues elevating higher and higher. You have been most inspiring to me as a human being first and foremost and then as a yoga student/teacher. I am very grateful to you. Staying in your presence lets us understand directly what Yoga is, I feel so blessed to have You as my Teacher, the most blessed….. nothing can express….just Grace to have met You. Beautiful and illuminating! This is the most lucid explanation of ‘letting go’ I’ve ever had. Thank you and God bless you for sharing your wisdom and love with us all! Thank you so much for sharing your love and wisdom with us – and the world. much love and gratitude from cape town. It was such a precious part to be accepted as a student in your courses. Your knowledge is that deep, vast, and complete, that I would like to say, “You are the Divine gift to spread the knowledge of Yoga on Earth.” Thank You for everything you did and do to uplift the energy on Earth and in our souls. Wah!!! Such a wonderful knowledge to kick start our New Year. The blog is really the best gift for everyone. No wonder people say must come for courses that conducted by Krishanji. I attended only one Sri Sri Yoga Course, surprisingly I was “awake” by Krishanji’s knowledge during the course. Tears of gratitude dropped like rain water. Life is a new journey after I met you last year. Please take good care of yourself, dear Krishanji. How lucky we are to have you in this lifetime. I feel so blessed to have take the SSY TTC with your guidance. SSY was a life transforming experience for me and am eternally grateful for your love, wisdom and expertise. I strive daily to work on the asana, pranayama and meditation that you taught all of us so diligently. Also special Thankyou to BharatiBen the medicines when I injured my shoulder on Day 10. Besides the acute shoulder pain, it also helped some of my chronic knee pain so nicely although it caused a little drowsiness which I could easily handle. We are truly blessed and so privileged that you shared with us on our courses. Dear Krishan ji, I just want to thank you for making my life turn into a meaningfully yoga journey. Thank you very much Krishnaji. It was awesome weekend with you as always. I am so fortunate that I got my Yoga training from you. The knowledge was incredible. The way you explain drop the judging about people all the time and about honor this mahamaya, not fighting with it is giving me so ease. I don’t know how you put it in so simple way yet so profound. I am really grateful for everything I get it from you and life. Thank you so much for being with us and offering TRM every year so I can come to you and rejuvenate myself with beautiful knowledge from you! It gave me so much clarity when you explained about space and objects in such way so now very easy for me to relate in my life. Thank you so much Dear Krishan Ji! We are so privileged to have been with you during those 3.5 days. You’re an amazing teacher, guru and inspiration for many including me! I have been experiencing supreme transformation within me over the last few days & am very eager to do the Sri Sri Yoga TTC now. Thank you. You will be forever etched in my heart as a true yogi and one who has inspired me. I sincerely hope I am blessed to do a course with you again. Thank you so much Krishanji. I feel blessed and honored to have been able to do the course with you. I can observe a shift in my awareness and perspective after the course, also feel so much more grateful. Felt so much grace during the course and your knowledge was mesmerizing, kept all of us longing for more! I want to thank you from the bottom of my heart for traveling all the way to be with us. I look forward to doing my next course with you.